A few weeks ago, location-based game SCVNGR launched a new feature called Rewards that makes it an increasing threat to the likes of shopkick, Foursquare, and every other company looking to combine the power of coupons and deals with location. The premise is simple: complete SCVNGR challenges to earn points, which you can in turn redeem for rewards at select merchants like Journeys. 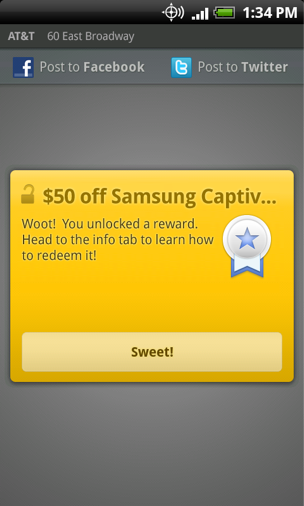 And today SCVNGR is adding a key new partner to its Rewards program: AT&T. 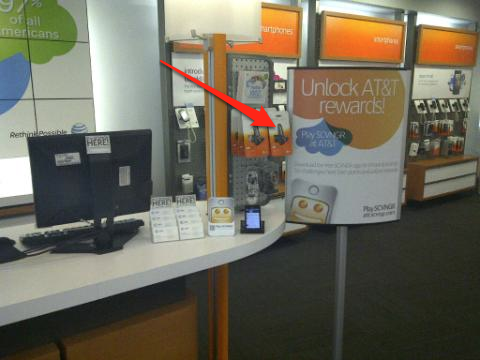 Over 50 AT&T stores across the midwest will be promoting SCVNGR as part of the launch of the new Samsung Captivate. AT&T will be using SCVNGR to offer three rewards: if you earn two SCVNGR points, you’ll get a free giftcard for a ring tone. Earn five points and you get 20% off accessories. And, in an especially compelling offer, if you earn 15 points at a store you get $50 off the phone — not too shabby. The deal is currently only running in the midwest, but SCVNGR CEO Seth Priebatsch sounds optimistic about AT&T pursuing a wider deployment depending on how this goes. Oh, and SCVNGR is getting paid for the AT&T deal, though Priebatsch unsurprisingly wouldn’t get into specifics. Unlike check-ins on Foursquare and Facebook Places, which aren’t especially engaging, SCVNGR revolves around more interactive challenges. For example, one challenge might ask you to take a goofy photo of a friend holding his new Android phone at the AT&T store. Other challenges include the recently-launched social check-in, which entails getting a few friends to tap their phones together to ‘check-in’ at the same place. Each of these actions earns points, which can be used toward SCVNGR rewards. Once you’ve earned enough points to redeem a reward, SCVNGR displays a screen on your phone instructing the cashier on how to give you your discount (this is more straightforward than having to print out a separate coupon). Priebatsch says that one interesting observation the company has seen since the launch of Rewards involves the distinction between coupons and rewards. He explains that many retailers aren’t particularly found of coupons, because they can cheapen the value of a given item in the buyer’s mind (he says the term “race to the bottom” frequently comes up in this context). Rewards, on the other hand — where the buyer needs to complete some tasks before they’re given access to the discount — don’t have that effect, because the buyer feels like they had to earn it, even if the net effect is the same at the cash register. Partnerships like the AT&T deal are important for SCVNGR, because the war over location looks like it will increasingly be fought through deals, rewards, and other partnerships. The basic act of checking into a venue is becoming commoditized, especially with the launch of Facebook Places and services like SimpleGeo — now startups are going to be adding additional layers like rich gameplay to attract more eyeballs and more businesses.